On November 13, 2012, a total eclipse of the Sun will be visible from northern Australia and the southern Pacific Ocean (PDF figure). The center of the eclipse path begins in Australia’s Northern Territory and travels southeast before hitting the only major populous area: the city of Cairns (PDF figure). In Cairns the eclipse will be visible for 2 minutes 11 seconds, starting at 06:38 AEST (local time) on November 14th (20:38 UTC on November 13), with the Sun lying a mere 14 degrees above the eastern horizon. After departing Australia, the path of the eclipse continues over the South Pacific Ocean. It reaches its maximum duration of 4 minutes and 2 seconds at 22:13 UTC over the South Pacific Ocean, at which time the eclipse path is 180 km wide. The eclipse finally terminates at 23:48 UTC at a point approximately 800 km west of Chile. To see a detailed description of the eclipse path, please visit NASA’s Eclipse Page. For general information about eclipse photography, please visit Fred Espenak’s Eclipse web site. You can explore the path of the eclipse using an interactive Google map, showing the paths of the umbra and penumbra. On November 1, 2012 we started an MHD computation of the solar corona, in preparation for our prediction of what the solar corona would look like during this eclipse. We used data measured by the HMI magnetograph aboard NASA’s SDO spacecraft. We used a daily-updated HMI synoptic map from November 1, 2012, which has data for Carrington rotation 2129 combined with data from -60° to +60° of central meridian from a disk magnetogram measured up to 11:54 UTC on November 1, 2012. A preliminary prediction of the state of the solar corona during the eclipse based on this data was posted on this web site on November 6, 2012. This preliminary prediction can be found here. 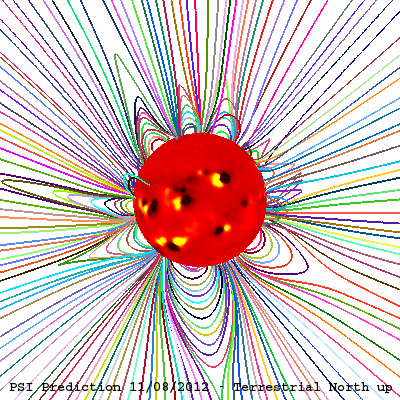 On November 6, 2012 we started a new calculation with updated magnetic field data. We used daily-updated synopotic HMI data for a combination of Carrington rotations 2129 and 2130, measured up to 11:54 UT on November 5, 2012. This page now has the updated (and final) prediction, and was posted on November 8, 2012. This year, we are also performing a computation using maps produced with the Air Force Data Assimilative Photospheric flux Transport (ADAPT) model developed by Nick Arge, Carl Henney, and co-workers. ADAPT ingests magnetograms from the National Solar Observatory’s SOLIS magnetograph at Kitt Peak. This model is still being tested, so this prediction (shown here) should be viewed as experimental. Our prediction is based on a magnetohydrodynamic model of the solar corona with improved energy transport. We used this model for the first time to predict the structure of the corona prior to the March 29, 2006 total solar eclipse. Since then, we have predicted a number of other total eclipses. The improved energy equation model includes the effects of coronal heating, the conduction of heat parallel to the magnetic field lines, radiative losses, and the effect of Alfven waves. This produces a significantly better estimate of the plasma temperature and density in the corona. For technical details about our improved model, please see the publications below. The prediction shown here uses our new model, and allows us to predict emission in extreme ultraviolet (EUV) wavelengths and X-rays. The EUV emission can be compared with solar observations from the EIT imager on SOHO, and the AIA instrument on SDO. X-ray emission can be compared with solar observations from the XRT instrument on Hinode. We also predict the scattering of polarized white light (polarization brightness, pB) that is typically measured during an eclipse. 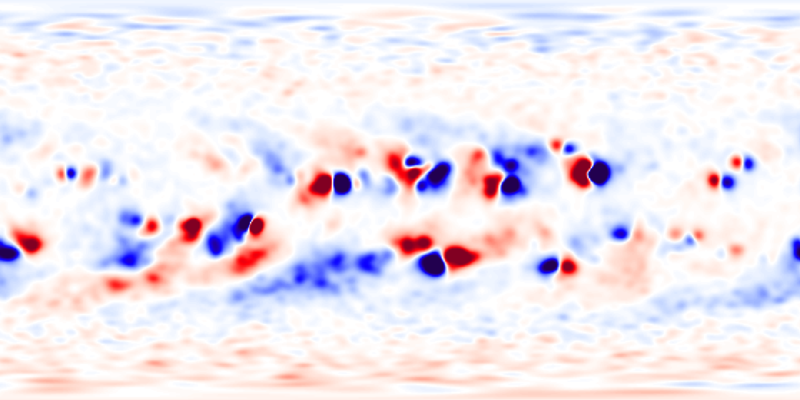 Movies of our simulated polarization brightness can be found below. You can read the technical details about the calculations that were used to make our predictions. If you are curious, you can read an account of our milestones in achieving our prediction. 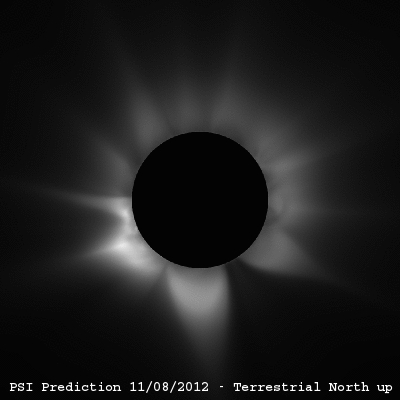 The figure on the left shows the predicted polarization brightness (pB) in the solar corona for the eclipse expected on November 13, 2012 at 22:13 UTC (corresponding to the moment of greatest eclipse in the Pacific Ocean). 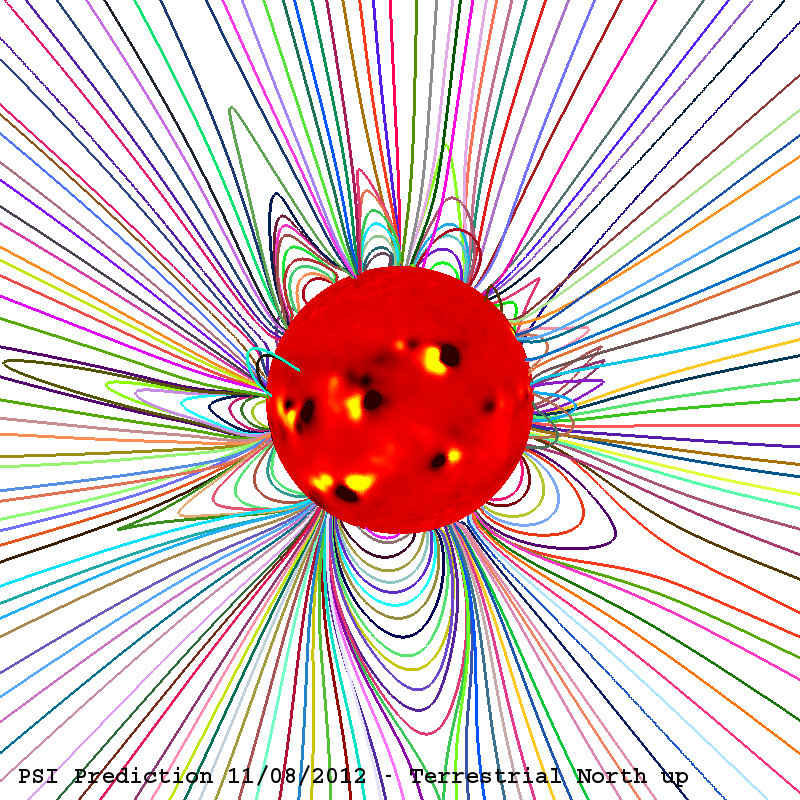 The state of the solar corona was computed using a 3D magnetohydrodynamic (MHD) simulation. The pB signal is produced by white light scattered off electrons in the coronal plasma. The image has been radially detrended using the Newkirk vignetting function to account for the fall-off of coronal brightness with distance from the Sun. Vertical (top) is terrestrial (geocentric) north. This is the view of the Sun that would be seen by an observer on Earth with a camera aligned so that vertical is toward the Earth’s north pole. To view this image in a coordinate system aligned with solar north, click here. Click the image to see it in greater detail. 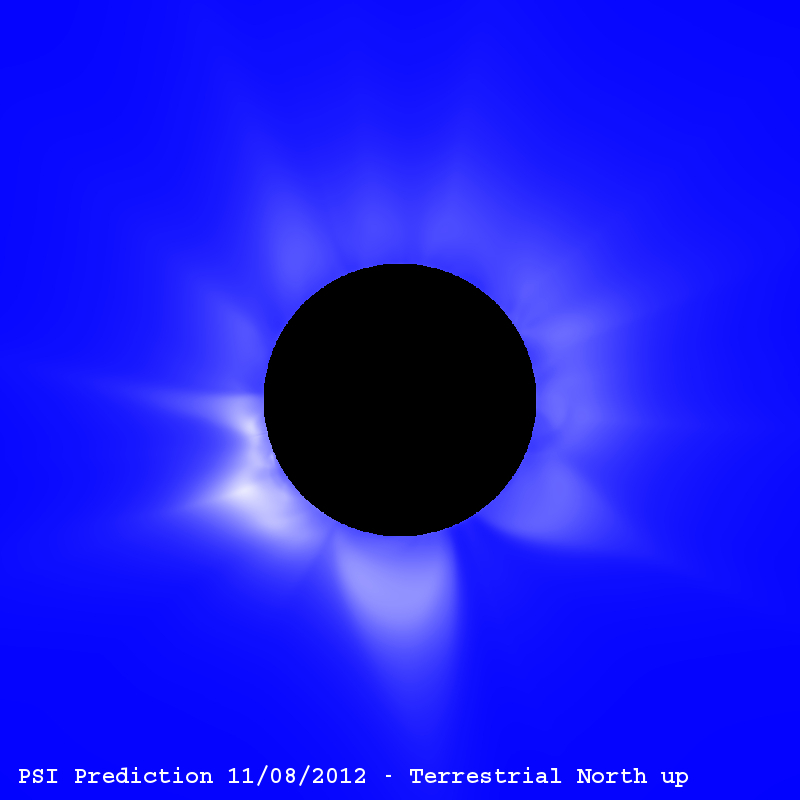 Predicted polarization brightness (left) together with traces of the magnetic field lines in the solar corona (right) for the eclipse expected on November 13, 2012 at 22:13 UTC (with terrestrial north up). The Sun’s surface shows color contours of the radial component of the measured photospheric magnetic field from the HMI magnetograph, showing the location of active regions (strong magnetic fields). Click the images for higher resolution pictures. To view these images in a coordinate system aligned with solar north, click here. This eclipse occurs during the approach to the current solar maximum (cycle 24), so the solar corona would be expected to have a more complex structure than at solar minimum, as seen in our prediction. The following figures show the evolution of the radial component (Br) of the solar photospheric magnetic field for approximately three Carrington rotations preceding the eclipse, as measured by the HMI magnetograph aboard NASA’s SDO spacecraft. The maps were suitably filled in the polar regions to account for missing data due to the tilt of the solar rotation axis. 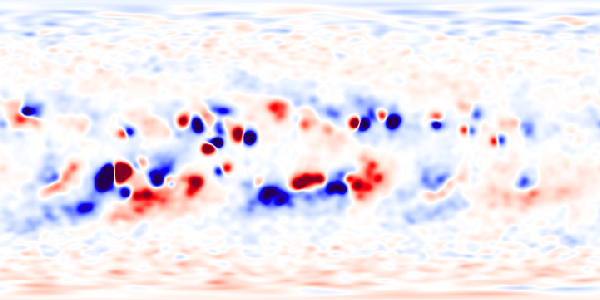 We also smooth the observed high-resolution data to a scale that is appropriate for our calculations by diffusing the radial component of the magnetic field. For this time period, the northern polar region of the Sun was better observed than the southern polar region. We filled missing data in the southern polar region from older data (from an average between CR2120 and CR2121, which were observed in February and March 2012). These maps show the radial component of the magnetic field (Br) deduced from the measured line-of-sight component of the photospheric field as a function of latitude and Carrington longitude. Red shows magnetic field directed out of the Sun; blue shows magnetic field directed into the Sun. Click the images for higher resolution pictures. For our final eclipse prediction we used the data in this last figure. We used a daily-updated HMI synoptic map updated on November 1, 2012 which have data for Carrington rotation 2129 combined with data from -60° to +60° of central meridian from a disk magnetogram measured up to 11:54 UTC on November 5, 2012, as explained here. It is apparent that the Sun’s photospheric magnetic field is evolving rapidly during this time of the solar cycle, with active regions emerging frequently and evolving considerably from one solar rotation to the next. This evolution necessarily makes our prediction less accurate, since we use data measured many days in advance of the eclipse to simulate the structure of the corona. The choice of time lag between when we issue our prediction and the time of the eclipse is influenced by our desire to provide sufficient advance notice to observers and the public, and the time it takes us to run an MHD simulation and process the results. Our 3D MHD model with improved energy transport allows us to simulate the emission from the corona in extreme ultraviolet and X-ray wavelengths. The Sun can be observed in these wavelengths from space. In particular, the SOHO/EIT, STEREO/EUVI, and Hinode/EIS telescopes routinely take EUV images of the solar corona, and the Hinode/XRT telescope images the soft X-ray Sun. Our simulated coronal emission is available here. We have made movies of the polarization brightness (pB) from our MHD simulation. This illustrates visually how the solar corona changes as a result of solar rotation. You can see a grayscale movie of pB with a black disk occulting the Sun: a GIF version (7.5 Mbytes, recommended), a QuickTime version (6.2 Mbytes), or a half-resolution GIF version (2.4 Mbytes). You can also see a movie of pB with a blue background and a black disk occulting the Sun: a GIF version (7.4 Mbytes, recommended), or a QuickTime version (6.4 Mbytes). If your movie player can continuously loop a movie while playing it, set this option to "on" for the best effect. NASA’s Eclipse web site (A great resource for the eclipse, including lots of information). Our work is supported by NASA, AFOSR, and NSF through the Strategic Capabilities program, by NASA’s Heliophysics Theory Program (HTP), by the Center for Integrated Space Weather Modeling (an NSF Science and Technology Center), by NASA’s Supporting Research and Technology (SR&T) Program, and by NASA’s Living With a Star (LWS) Program. We are grateful to NASA’s Advanced Supercomputing Division (NAS) for an allocation on the Pleiades supercomputer, and the Texas Advanced Computing Center (TACC) for an allocation on the Ranger supercomputer. Our calculations for the eclipse prediction were performed on these computers. 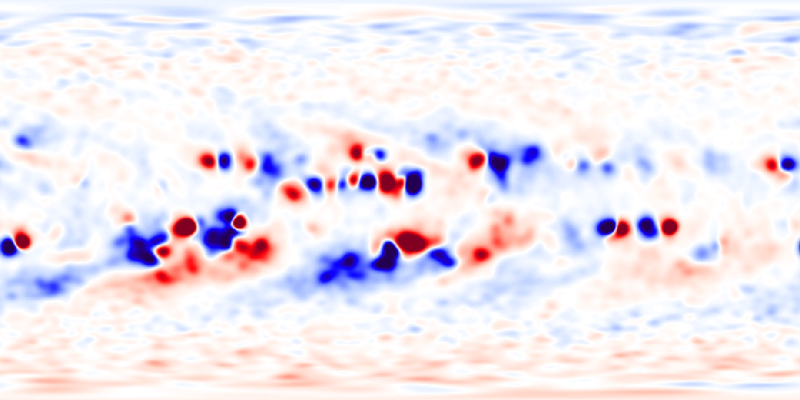 We thank the SDO/HMI team of the Solar Physics Group at Stanford University for their superb efforts in providing timely access to HMI Synoptic magnetograph data.